It was one of the first sunny evenings of the summer and the sound of children playing in the leafy park outside The Firehouse seemed a bit incongruous given the heavy line-up at the venue tonight. Unfortunately, because of other commitments, I missed the beginning Stukka Squadron's set but managed to catch the last few songs. 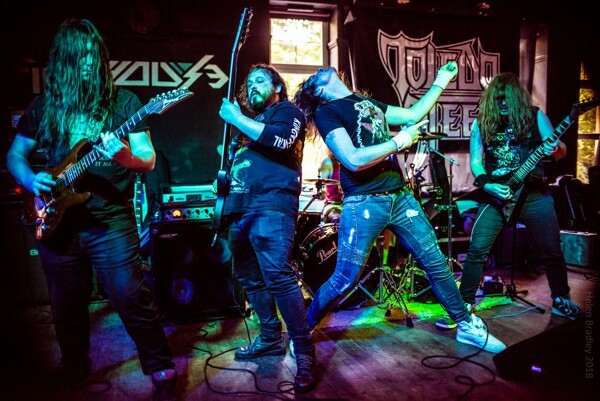 They are a Nu New Wave Of Heavy Metal band, and I mean this in the true sense of the genre – this is no-frills, headbanging stuff on which all other versions of Metal have been built. 'We Drink Blood' is so retro it's a joy. I know Terrordrone of old, so I have ear defenders at the ready because this band is loud! They make your brains drizzle out of your ears as they race through their set like maniacs. 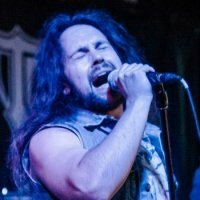 To say Tom Foster Grundy is a Judas Priest fan would be one of life's understatements, once you understand this, you get the band's influences, which they help along with a frenetic cover of 'Jawbreaker' before moving on to Manowar's 'Sign Of The Hammer'. Their own songs, such as 'Theatre of Death', generate more energy than the National Grid. They always leave you slightly exhausted and gasping for beer, and tonight was no exception. I've never heard of Skyryder and a quick internet search on the iffy wi-fi reveals they hail from Newcastle. 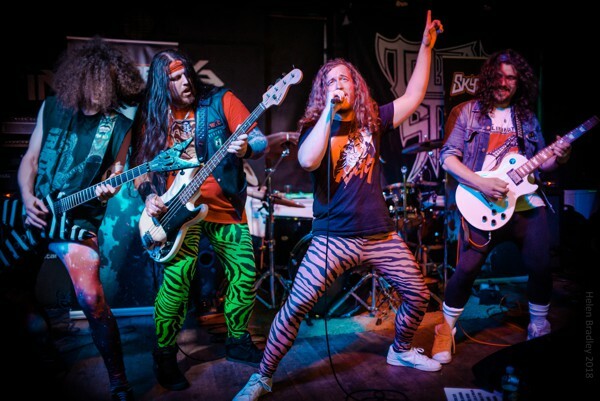 How would I describe them, the best I can offer is if Steel Panther were Geordies playing Heavy Metal and were manlier, then that would be Skyryder. It was a tight, accomplished set which the band delivered with Geordie wit and charm... and a lot of hair. I particularly loved their cover of Yngwie Malmsteen's 'Rising Force', a brave moved they carried out with confidence and panache. Toledo Steel were on home turf tonight and The Firehouse gradually filled up. The evening eventually turned into a proper Heavy Metal fest and some of the audience were wearing fashion I suspect their parents wore originally; I didn't know you could buy spandex anymore! Opening with a track off the new album, 'Rock Nights', they proceeded to try and tear down the walls (which would be quite nice because the gorgeous day is starting to affect the temperature in the room). Rich Rutter proved he has got that authentic screaming style down to a fine art and his voice powered over the twin axe work of the piledriving guitars of Tom Potter and Josh Haysom. They proceeded through tracks from the album, such as 'No Quarter' and the fantastically named 'Heavy Metal Headache' and a rocking cover of Judas Priests' 'Heading Out For The Highway'. They closed out with the Iron Maiden-esque 'Black Widow'. 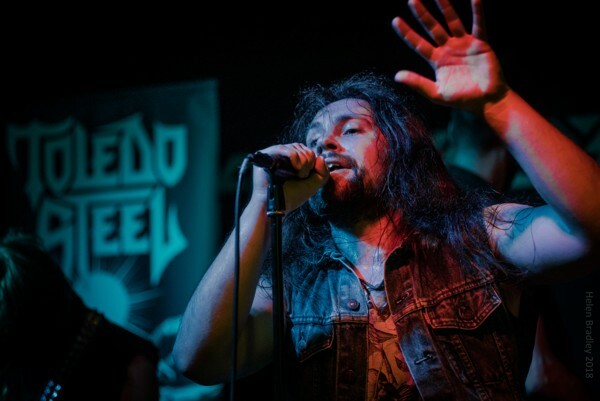 This turned out to be an evening of quality Heavy Metal and the four bands really evoked the genuine feel of the clubs of the early eighties; suffice to say, there was a real energy in the room that comes from true passion. These four bands seem to quite often play together in a variety of combinations right across the country and it is worth looking out for them. If you are lucky enough to get all four together, you'll have a truly authentic taste of the London Metal scene circa 1981.